Slater Mill Historic Site. —. 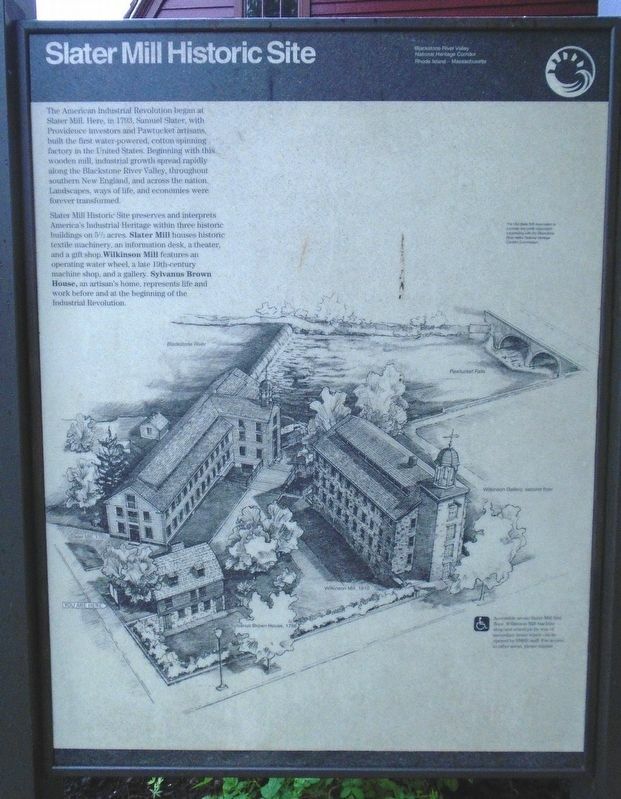 The American Industrial Revolution began at Slater Mill. 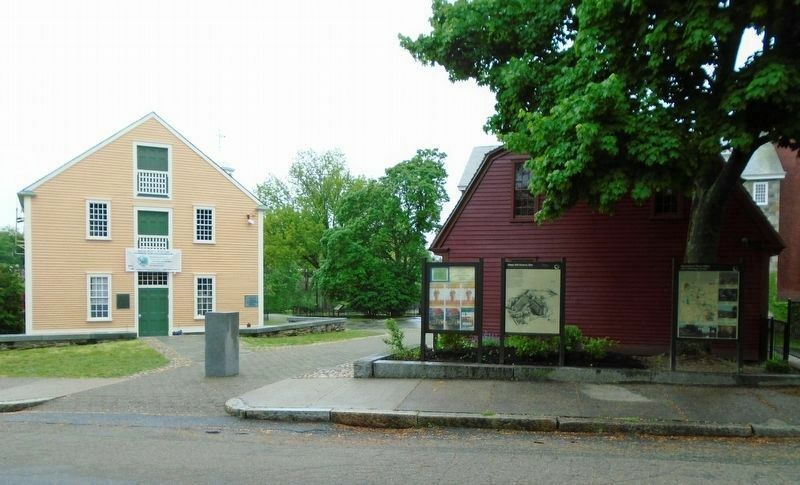 Here, in 1793, Samuel Slater, with Providence investors and Pawtucket artisans, built the first water-powered, cotton spinning factory in the United States. Beginning with this wooden mill, industrial growth spread rapidly along the Blackstone River Valley, throughout southern New England, and across the nation. Landscapes, ways of life, and economies were forever transformed. Slater Mill Historic Site preserves and interprets America's Industrial Heritage within three historic buildings on 5½ acres. Slater Mill houses historic textile machinery, an information desk, a theater, and a gift shop. Wilkinson Mill features an operating water wheel, a late 19th-century machine shop, and a gallery. Sylvanus Brown House, an artisan's home, represents life and work before and at the beginning of the Industrial Revolution. Erected by Blackstone River Valley National Heritage Corridor and Old Slater Mill Association. In front of the Sylvanus Brown House (red), with Slater Mill (yellow) to left, and the stone Wilkinson Mill barely visible beyond the Brown House. 52.674′ N, 71° 22.957′ W. Marker is in Pawtucket, Rhode Island, in Providence County. Marker can be reached from Roosevelt Avenue south of Leather Avenue, on the left when traveling south. Touch for map. Marker is at or near this postal address: 67 Roosevelt Avenue, Pawtucket RI 02860, United States of America. Touch for directions. Other nearby markers. At least 8 other markers are within 2 miles of this marker, measured as the crow flies. Sylvanus Brown House (here, next to this marker); First Successful Cotton Mill in America (a few steps from this marker); The Old Slater Mill (a few steps from this marker); Wilkinson Mill (within shouting distance of this marker); a different marker also named The Wilkinson Mill (within shouting distance of this marker); Waterpower (within shouting distance of this marker); a different marker also named Old Slater Mill (within shouting distance of this marker); Pierce Park and Riverwalk (approx. 1.2 miles away). Touch for a list and map of all markers in Pawtucket. More. Search the internet for Slater Mill Historic Site. Credits. This page was last revised on June 5, 2018. This page originally submitted on June 5, 2018, by William Fischer, Jr. of Scranton, Pennsylvania. This page has been viewed 53 times since then and 9 times this year. Photos: 1, 2. submitted on June 5, 2018, by William Fischer, Jr. of Scranton, Pennsylvania.